Colliers International, a Canada-based global commercial real estate services organisation, has conducted a research on a few locations in India and released a report called Top Locations in Asia: Technology sector. The report is based on a comprehensive study that examined around 50 criteria across socio-economic, property, and human factors, in 16 cities in developed and emerging markets across Asia, to find out the viability of these cities as tech hubs. 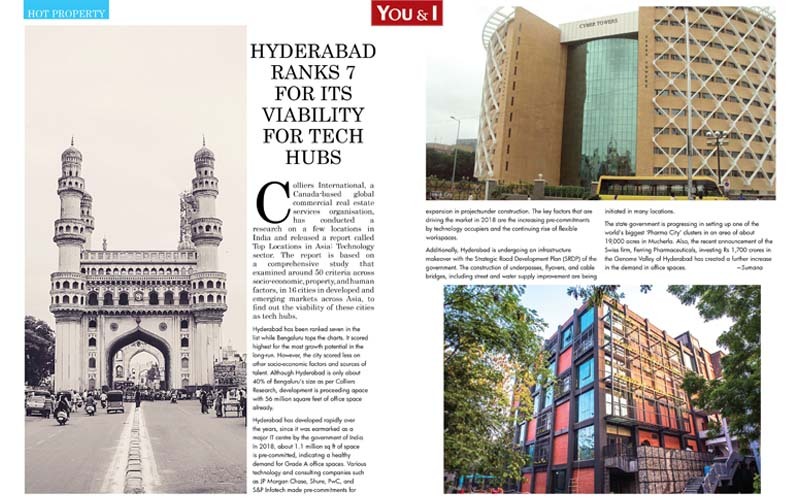 Hyderabad has been ranked seven in the list while Bengaluru tops the charts. It scored highest for the most growth potential in the long-run. However, the city scored less on other socio-economic factors and sources of talent. Although Hyderabad is only about 40% of Bengaluru’s size as per Colliers Research, development is proceeding apace with 56 million square feet of office space already. Hyderabad has developed rapidly over the years, since it was earmarked as a major IT centre by the government of India. In 2018, about 1.1 million sq ft of space is pre-committed, indicating a healthy demand for Grade A office spaces. Various technology and consulting companies such as JP Morgan Chase, Shure, PwC, and S&P Infotech made pre-commitments for expansion in projectsunder construction. The key factors that are driving the market in 2018 are the increasing pre-commitments by technology occupiers and the continuing rise of flexible workspaces. Additionally, Hyderabad is undergoing an infrastructure makeover with the Strategic Road Development Plan (SRDP) of the government. The construction of underpasses, flyovers, and cable bridges, including street and water supply improvement are being initiated in many locations. The state government is progressing in setting up one of the world’s biggest ‘Pharma City’ clusters in an area of about 19,000 acres in Mucherla. Also, the recent announcement of the Swiss firm, Ferring Pharmaceuticals, investing Rs 1,700 crores in the Genome Valley of Hyderabad has created a further increase in the demand in office spaces.